which meant a lot for this Cape Verde native. Cape Verde is an archipelago located in the central Atlantic Ocean, off the coast of Western Africa. Upon her arrival in France as a child, Mo’Kalamity grew up in the Paris area. Highly inspired by Caribbean and African-American musics, reggae for “the message and the power of its music” became the obvious choice. A self-taught artist, Mo’ got her start as a backup singer before forming her own band The Wizards in 2004. Her debut album Warriors of Lights, which was self-produced, was released in 2007 with the support of the public L’Assoc’ picante. A new edition of the album was followed by an album release party in 2008. The event took place at the New Morning, sponsored by Mondomix magazine. Mo’ quickly became a household name in this male-dominated genre that is French reggae. 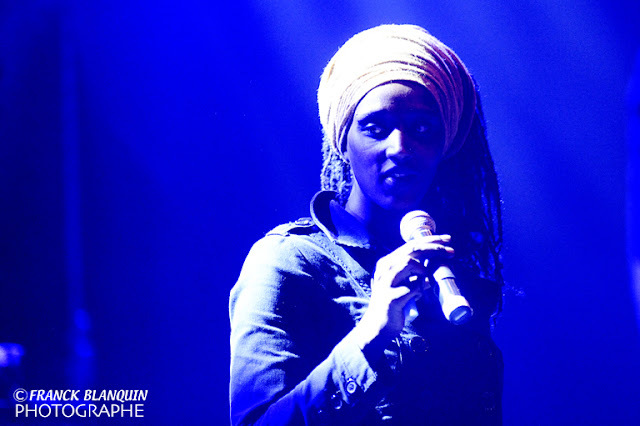 Her smooth and melodic voice effortlessly suits deep and activist roots reggae. Between 2007 and 2008, Mo’ and The Wizards, landed several gigs including Salif Keita that they opened for in Argenteuil. The following year, they devoted themselves to recording their sophomore album Deeper Revolution. In this record, she touches on the highs and lows of humankind: the North-South divide, differences, violence against women… “In this album like in most of my work, there’s something urgent, issues that need to be addressed right away”. The LP was released in 2009, followed by 2 singles (Autour de Toi and Deeper Revolution) to promote the album. Pietro Di Zanno directed the videos to those 2 singles. After performing on different stages between 2010-2011 next to acclaimed artists such as Winston McAnuff, Rod Taylor and Aswad. The Gladiators, Mo’ and her Wizards open for the Reggae Sun Ska Festival. Those two years gave the group the opportunity to perform abroad: with Queen Omega in Portugal and in her native country, Cape Verde including the noted Bais Gatas Festival. In 2011, Mo’ was nominated at the Cabo Verde Awards in 3 different categories (Best Reggae Album. Best Video and Breakthrough Artist of the Year). A few months later, she was invited to perform in Morocco as part of the Azalay Festival. Mo'Kalamity is swimming between spiritual lyrics and more "Militant" tracks, the singer-songwriter is more than ever calling for a rude awakening.